Clinical Evaluation Services for individuals with concerns over building-related illness are available at UConn Health, Occupational and Environmental Clinic, 860-679-2893. All school buildings should welcome each student and staff member with an indoor environment that works to allow and encourage the best results in teaching and learning. The Center for Indoor Environments and Health has actively worked to improve the environment where the school building's condition has contributed to occupants experiencing concerning health symptoms. Our knowledge and perspective on the problems school communities face results not only from our consulting experience directly with school districts, but our work with federal and state agencies. Programs have included guidance on Environmental Protection Agency Indoor Air Quality Tools for Schools program, trainings customized for school nurses on illness and school environments, and guidance for clinicians on addressing health effects relating to mold/moisture in the indoor environment. 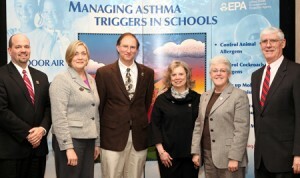 We were invited by the Connecticut Academy of Science and Engineering to participate in a critical review of indoor air pollution in schools requested by the Environment Committee of the Connecticut General Assembly that became a basis for the Indoor Air Quality in Schools Legislation passed in 2003. Our experience is enriched by working closely with the physicians in the Division of Occupational and Environmental Medicine. When the clinician is concerned that the school environment is contributing to a patient’s illness we review teachers’ classrooms to identify possible environmental exposures. Then we provide guidance to the physician for his/her management of the patient, and suggest building interventions to school facility staff to improve the indoor environment. The adequacy of ventilation and the sources of biological and chemical air contaminants are key factors that contribute to the quality of indoor air.